Stylistically experimental with works ranging from figurative to abstract, his paintings defy strict categorization. In fact, at a recent show at the Pleiades Gallery in Chelsea, only a mastery of tonal contrasts, a bold use of lights and darks, suggested that these various works were by the same artist. Brodkin admits that he loves to concentrate on philosophical ideas. He is a serious man, well spoken, and somewhat professorial. “My pieces have to be conceptually compelling but also aesthetically pleasing,” he says. With “Cityscape XII” the artist explores irregular shapes and three dimensionalities using cardboard, canvas, and Masonite. The cardboard towers resemble a piece of Futurist sculpture with their thrusting verticals, but the intent is to make you stop and consider how the incessant construction of tall buildings will affect the future cityscape. LISTEN! Thunderclaps! Echoes! Over Long Island! It is with two paintings about a thunderstorm on Greenwood Lake in Northern New Jersey that this versatile painter expresses his intense interest in nature. Both “Listen! Thunderclaps! Echoes! 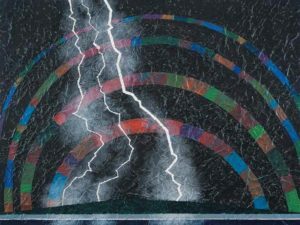 Over Long Pond,” acrylics on crinkled paper on a black painted canvas, and “Come the Furies Over Long Pond” capture the energy emitted by serious claps of thunder. “I used burlap on canvas as I was experimenting with materials,” says Brodkin. Inspired by the work of Catalan painter Antoni Tapies (1923-1988) who used everything from waste paper, string, and rags on his paintings, Brodkin incorporates discarded materials in his work so that his surfaces have a variety of textures. A kind of alchemy takes place from this use of mixed-media, transforming what might have been a typical painting of a thunderstorm into something much more menacing and captivating. These storm are the visual equivalent of perfect pitch. Their detailed observation is not at all complete representation, but delivers the effect of hearing, seeing, and not quite believing the power of what you are witnessing. One painting in his recent show, “Kiki & Kelly…For as Long as Songbirds Sing,” is a tribute to two outstanding women: his wife Kiki, a well-known, accomplished artist who died five years ago, and Kelly, the daughter of a close friend, a former model and nurse, who died at an early age. The style is pure Warhol. The work consists of a series of head shots of the two women. Like Warhol’s Jackie or Marilyn series, they are posterized photographs, reproductions having only solid tones and little detail. 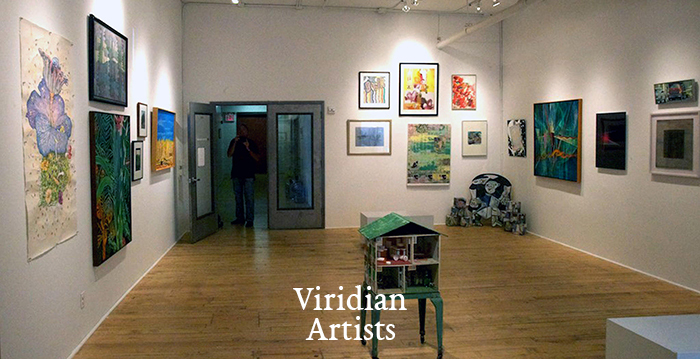 Brodkin does most of his work in a studio with a 12-foot window in his house in Paramus, New Jersey. He can do almost any type of work there except welding. Years ago, he found that he was allergic to turpentine so he switched from oil painting to acrylics which play a major role in his paintings. “I have always been intrigued with man’s place in this world,” he says. “That is why I experiment, not to necessarily find answers, but to be a seeker, someone who not only wants to link colors together, but also people.” Crossing lines between figurative and abstract is another of his efforts to get away from the conventional, according to this very unconventional painter.